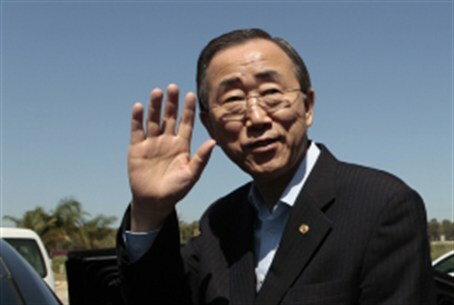 UN Secretary General Ban Ki-moon will visit Israel next week in an attempt to bring an end to Israel’s military operation in Gaza. UN Secretary General Ban Ki-moon will visit Israel next week in an attempt to bring an end to Israel’s military operation in Gaza, it was reported on Thursday. Ban will arrive in Israel on Tuesday and will hold a series of meetings with government officials in Jerusalem and Ramallah. Officials in Jerusalem explained that the purpose of Ban’s visit is to bring down the tension in the region. He is not expected, however, to visit Gaza. Meanwhile, French Prime Minister Jean-Marc Ayrault told reporters on Thursday that President Francois Hollande has been holding talks with Prime Minister Binyamin Netanyahu and with other leaders in an attempt to bring calm to the region. "It's time to stop the escalation which endangers the security of Israel and its citizens, as well as that of Palestinian citizens," said Ayrault. He added that Hollande had also spoken to Egyptian President Mohammed Morsi about the escalation. The United States is also trying to stop the fighting. Deputy National Security Adviser for Strategic Communications Ben Rhodes told reporters on Thursday that the Obama administration has been in discussions with Turkey, Egypt and other countries thought to have sway over Hamas in order to get them to urge the terror organization to halt its rocket attacks on southern Israel. "We pushed those who have influence on Hamas to use their influence to urge Hamas to bring calm," said Rhodes. He added that Washington does not interfere in Israel's military goals, including the possibility of entry of ground forces. "Ultimately, the Israeli government determines how they will carry out their military operations," he stressed. Earlier Thursday, Netanyahu spoke to Obama, who reiterated the United States' support for Israel's right to self defense in light of the barrage of rocket attacks being launched from Gaza against Israeli civilians. A senior government official told Channel 10 News on Thursday that Egypt is trying to promote a ceasefire between Israel and Hamas, but that Jerusalem has turned down Cairo’s proposal, saying that Israel would agree to a ceasefire only if Hamas will undertake to stop the smuggling and production of weapons. The IDF said on Thursday night that since the beginning of Operation Pillar of Defense, it has struck more than 300 targets throughout Gaza. The statement said that during the day on Thursday, the IDF continued to launch attacks on dozens of rocket launching sites in Gaza, causing them significant damages. On Thursday evening, the IAF launched a second assault wave on Gaza, targeting 70 underground missile sites.